Consumers love video. A whopping 45% of people watch an hour or more of video daily and a staggering 43% of people desire to see more video content from brands and marketers. So this goes without saying: your business needs videos. You see, to stay competitive, you must give the people what they want! Implementing marketing videos into your content arsenal will help drive engagement, boost brand awareness, and build authentic relationships with your audience. You'll also move your viewers to action faster. According to HubSpot, consumers who view video are 1.81 times more likely to purchase than a non-viewer. The benefits are too compelling to ignore. But where you do start with creating quality videos for your marketing strategy? What types of videos should you focus on to get the best ROI and traction from your efforts? There are certain key videos you want working in your video marketing to yield favorable results. As you begin to map out your strategy, ensure to include the following marketing videos that your business needs to succeed online. Did you know 84% of people trust online reviews as much as friends (Source: Inc)? Customer reviews and testimonials have an incredible impact on consumers. It can greatly determine whether or not they decide to do business with you based on others' experiences. Testimonial videos are even more persuasive. By getting your customers to share their positive experience on video, you'll quickly gain your audience's trust and significantly boost brand credibility. Videos are powerful tools for connecting and triggering an emotional response. Your customers are your best advocates for promoting your business. Fusing the two is a double-edged sword that can bolster your content marketing and attract prospective clients that are curious to learn more about how you can help them. Showing your followers how to achieve a goal or accomplish a task is a top tactic to stand out from the crowd and be memorable. Using video is even better! The good news is, how-to videos perform extremely well on social media. It's the perfect strategy to generate engagement and increase your organic reach. They're also ideal for engaging your email list, publishing on YouTube, and embedding in your blog post content. These multi-faceted videos can be used in different stages of your buyer's journey. Now, for social media, your how-to videos need to be short and concise, about 30-seconds long. During your video creation, demonstrate the most basic steps, then shorten your video during the editing phase. These how-to recipe videos were used by Purely Pecans to show people how to incorporate their delicious pecan butter in to every day snacks. End with a call to action, showing users how they can remain connected to you by subscribing to your list. Did you know 72% of people would rather use video to learn about a product or service (Source: HubSpot)? Also, adding a product video on your landing page can increase conversions by 80%. So, every business should have marketing videos that highlight their products or services. Stats and facts prove that product videos are excellent revenue-generating tools! They give you a chance to explain how your product works, the benefits, the results users can expect to gain, and address common questions and concerns. Therefore, start with your flagship product or service. Make this video compelling and be sure to give a call to action at the end on how viewers can make their purchase. A huge benefit of video marketing is that videos can explain everything. As you use them to promote a new product launch, content piece (i.e. eBook or eGuide), upcoming event, or your brand, videos make it super easy for viewers to consume your details. Promotional videos do just that and give people the extra nudge needed to take action. You see, whereas some may be persuaded by a social media post, Facebook ad, or an email, most respond to video. Your promotional video offers an additional way to digest your message while being effective at reaching your audience. A big benefit is that your promotional video doesn't have to be long. The key here is the call to action. You want to tell users exactly what to do next to make your promotional video effective. Whether your goal is to capture leads, generate sales, or boost attendance at an event, give clear instructions to increase success. With over 81% of businesses using video as a marketing tool, a smart strategy to separate your brand from competitors is by creating a (or multiple) video series. The advantages here is that you take your users on a journey and offer a more in-depth content piece that brings value. In fact, a video series works well for an email campaign. It can serve as your introductory email series where each video builds upon the previous shared or as a free mini-course you're offering to generate new subscribers or to nurture your existing leads. Either way, creating a video series cements your brand's authority and delivers amazing value to your audience. A training series bolsters thought-leadership, positioning you as a reputable source in the industry. The final marketing video that every business needs is one that features your company's events. 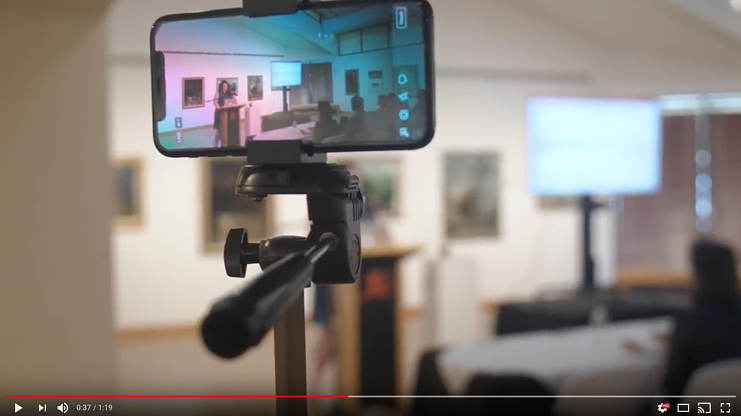 Conferences, training events, or any event that involves live customer interactions are incredibly valuable to your content marketing strategy and should be captured on video. These videos can be sliced and diced to amplify your social media marketing, YouTube strategy, and website content. You can also use this event coverage to promote the next event. Doing so shows that your brand is actively involved in your industry and with customers. You'll also further humanize your brand as opposed to one that simply stays behind the computer or online. People want to see a face with your business, which makes you more personable and real. So, at each event, consider hiring a video team onboard to capture these moments. Or, if you're on a smaller budget, you can record and livestream parts of the event from your phone. As you hone your video strategy, be sure that these marketing videos are included in your arsenal. As a result, you'll experience better follower engagement, increased email subscribers, improved sales, and greater retention.